This time last year going for a run was something that I did not do. I couldn't run for 5 minutes, I had running trainers but these were about 10 years old and hadn’t seen the light of day for many years. But after hearing about Park Run I attended my first 5km run in December 2014. I started off jogging and soon found myself out of breath and walking around the 5km course but I got around the course and although I came in last with only the tail runner behind me I felt great having attempted to run again. The following day I could barely walk, my muscles hurt, going up and down stairs was a challenge but after a few days of this wearing off I was already thinking about going to Park Run the following week. As the weeks went by I was not only going to Park Run on a regular basis I was getting quicker and beginning to really enjoy running. As the weeks passed I bought new runner trainers, new running clothes and was really getting into my new hobby. As the spring approached, so did my 30th birthday and with this I decided that what better way to celebrate then signing up to do my first half marathon. 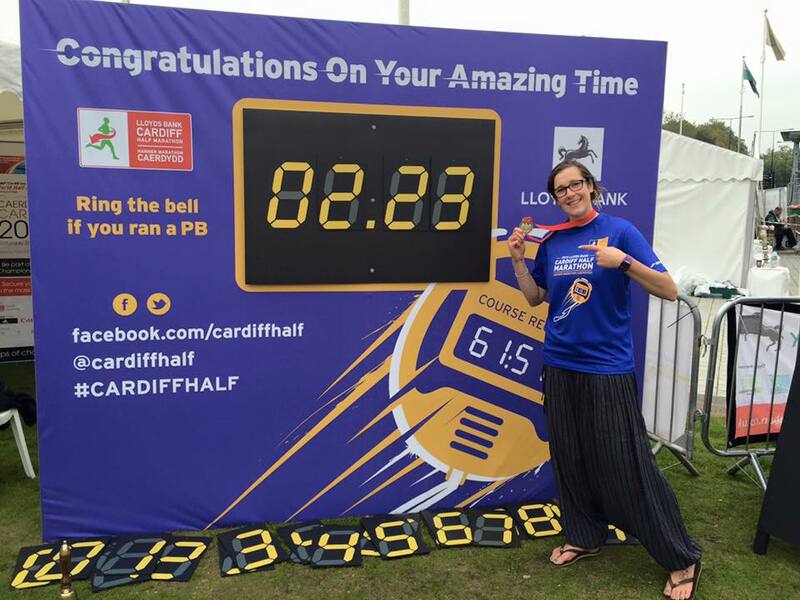 In May 2015 I signed up to run in the Cardiff Half Marathon in Cardiff in October 2015. I figured that was plenty of time to get fit. What I hadn't anticipated was that not long after my 30th birthday I had pulled a muscle in my calf that just would not heal. After weeks and weeks of treatment through the physiotherapist and the chiropractor and joining a weekly yoga class just six weeks before the big day I did my first run in three months. The massive break was absolutely heart-breaking. I had only just found something that I really enjoyed and was really looking forward to it and all this seemed to be in jeopardy with my injury. However those six weeks before the half I started training, I started with walking gently building up the miles walked before adding a one mile run in themiddle of my walk. Slowly I gradually started to build the distance back up and hoped that in just six weeks I would be able to run a whole 13.1 miles. The weekend of the half marathon arrived and we left Cornwall and drove the three hour journey up country and across into Wales. 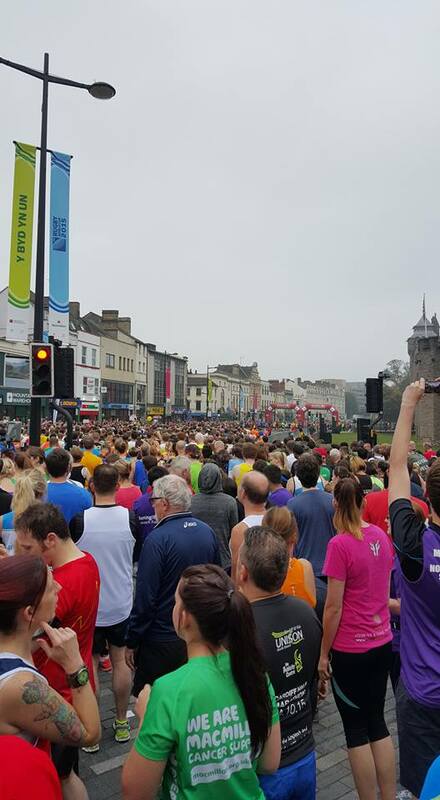 Arriving in Cardiff we ventured into the runners village to get our bearings to know where to head the following morning. We then found the hotel and had a lazy evening of carb loading and watching movies. As the morning of the race approached I couldn't sleep and woke up at 6am full of nerves and excitement. I tried to get some breakfast down me but being so nervous and up so early I could only manage to eat a small cereal bar. Not before long it was time to leave the hotel and take the 30 minute walk from the hotel to the start line. As we left our room there were lots of other runners also out early on the Sunday morning and we followed crowds of people walking the same direction in running clothes into the city centre. Finding my pen, which wasn't hard as it was the slowest pen of the day right at the back, I joined the massive queue for the portaloo and after a 20 minute wait there, it was time to line up and get ready to run. There was literally 5 minutes to spare where I strapped my phone to my arm, arranged my headphones and gave my hoody to my partner and it was time to go. The crowds sang the Welsh national anthem, which I didn't know but it felt rather patriotic with 20,000 people all singing along. As each of the pens were released the gun would sound, the runners would set off and we would shuffle forwards getting closer and closer to the start line. 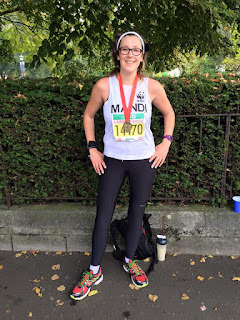 Being my first half marathon I was really excited and really nervous, I was carried along in the crowds and the excitement and it hadn't really dawned on me about the actual run ahead. 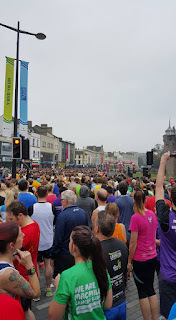 Before I knew it we headed around the corner of Cardiff castle and the start line was in sight, the gun sounded and the pen in front of us were off and it was now our time to go. It was about 15 minutes since the official start at 9.00am when our gun fired, my heart skipped a beat and we were off. 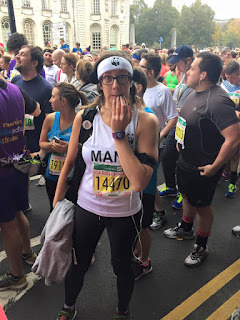 Cheering, screaming, clapping, the crowds were amazing, I bounced along smiling as I went, waving at completely random people as they called my name off of my running vest. 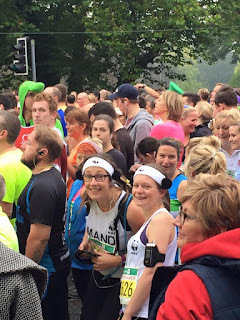 Then the crowds died down, the runners started to spread out and we got into our groove and It was there, I was running my first ever half marathon! The emotions came over me in waves, running behind someone which had 'Nan' on their running vest and running for Cancer Research made me well up and felt a sense of amazement that I was one of these awesome people up early on a Sunday morning doing something gruelling to help others. I was doing this to raise money for WWF and help the environment and endangered animals and again feeling a sense of pride the emotions of the day washed over me. 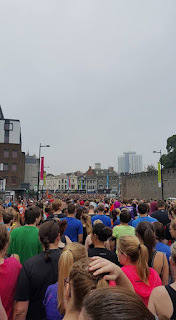 After about 15 minutes we had left the city centre and was now running alongside industrial area and car show rooms the crowds of support were not as present in this area and this was when it started to dawn on my just how much of a journey I was going on this morning. I don't know Cardiff and I had never done a half marathon before so all was a new experience to me. After several more minutes of running I saw the sign to mark the two mile point. I'm not sure what happened to the 1 mile mark I must have missed this but hitting the 2 miles it really dawned on me just how far this run was going to be. Just after the 2 mile mark an ambulance sounded it's sirens and started to gently work its way through the runners to some body in need. This completely shocked me into reality, this wasn't a 5km park run jog around, this was a massive challenge and I had over ten miles to go and already people were in trouble and needing assistance. In my mind I thought about my run and worked out in my head that I would use an energy gel at each 4 mile marker and I only had 2 miles to go until my first boost of energy. Reaching the 4 mile mark I reached for my first energy gel and managed to squeeze most of the contents of the sachet all over my hands and down my front and found myself in an awful sticky mess! Now not only was the realisation that I was running on empty and the cereal bar that I had for breakfast several hours earlier wasn't much sustenance to run 13 miles, my first energy gel was all over my body rather than in my body. My mood was picked up by the glimpse of boats on the water and the sound of music up ahead and I picked my head up consumed what was left in my energy gel and carried on. As I continued plodding along I soon reached the Cardiff barrage and was jogging along by the sea. Having lived in Cornwall for the last 9 years seeing the sea gave me another boost and before I knew it I was passing through the 5 mile marker. Continuing along the marathon course I turned right away from the water and headed through the six mile marker and passed through the water station where I was grateful for a bottle of water not only to drink but to rinse over my hands to remove some of the sticky mess that I had got into a couple of miles previously. 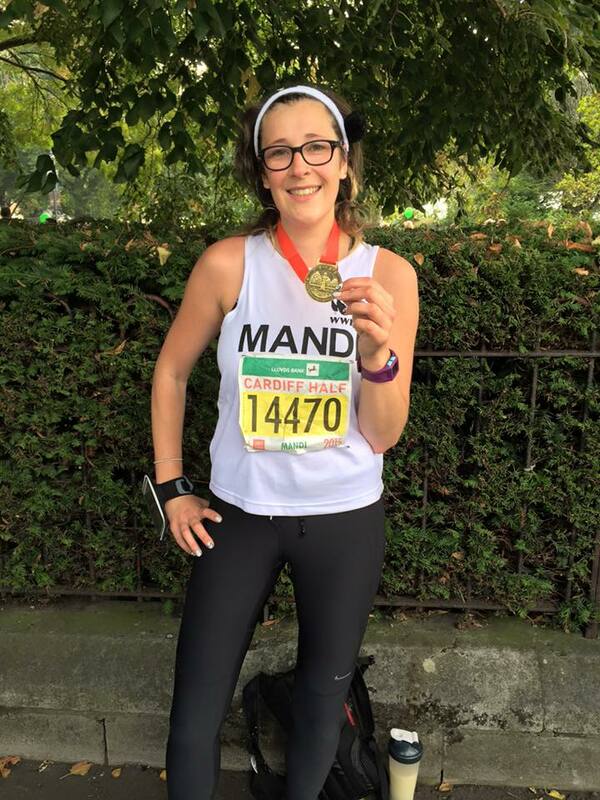 I ran through cheering crowds, live music and lots of support, passing under a poster saying nearly halfway there I was feeling really strong and really enjoying the run. I knew that I was now working towards seeing the support from my boyfriend who had promised to try and see my pass at mile eight. To get to mile seven and eight was a little bit challenging, as you left the beauty of the harbour and the distraction on the sights and crowds the miles went by quite quickly. However the next two miles were up and over a duel carriageway. There were a few supporters on the side of the road, some set up for the morning with deck chairs and flasks but the gradual uphill over the roads below and seeing cars whizzing up alongside us on the other side of the dual carriageway was mentally quite draining but as we reached the end of the dual carriageway we headed back into the city and back into roaring crowds of support. It seemed that mile seven on that dual carriageway was ages ago and I was now starting to feel the run in my legs but I knew that seeing my boyfriend would spur me on. As I started getting to what I thought would be closer to mile eight where we had agreed he would try and see me the crowds were all starting to build. I kept to the middle of the road and scanned left and right desperately trying to spot him. To my delight I could see him up ahead on the left, I started to weave in and out of runners and make my way over to the side of the road with a swift high five and a shout of good luck I continued and headed towards mile 9. I was really starting to feel it now and consumed another gel shot, this time I opened it more carefully and managed to actually eat the majority of the gel. The support around these miles was great there were crowds in the streets cheering us on there were people holding out trays of jelly babies and the local church offering out cups of water. After mile 9, I approached an out and back section and got a glimpse of people 2 miles ahead of me passing me at their mile 12 point and it was here that I really hit the wall. As I approached mile 10 we were running alongside the Roath Lake. I passed an old peoples residential home where all the elderly were sitting outside wrapped in blankets holding up signs saying only 2.5 miles to go. It was here I started to hit the wall, 2.5 miles to go, this was like doing another whole parkrun. I was seriously flagging, I kept getting glimpses of the runners on the other side of the lake that were closer to finishing and I was really struggling on through. I turned the corner at the top of the lake and knew we were heading back into the city now and then BAM. I got cramp in my toe! I wiggled my toes to try and rid the cramp and then it went from cramp in a toe to my whole leg going stiff, cramping and into spasm. I went from the steady paced jog that I had been doing for the last 2 hours to a walking limping cramping mess. I decided that now was the time to consume my last energy gel to get me through the last 2 miles. I could see the mile 11 marker in the distance and told myself to walk and consume the gel and consume some water and hope that the cramp would soon go. Of which it did and with people calling my name and cheering me on I picked up the limpy walk fritted my teeth and got back into a slow jog and found myself getting back into the grove a bit... and then comes the hill!!!! I was warned about the hill at mile 12 and I looked at the gradient map and though pfffft If I can do Lanhydrock Park Run which is one of the toughest park runs in the UK then this hill would be a doddle. OH how wrong could I be, the minute I hit the change in gradient and the change in pace the cramping and twinging fired back into my leg. 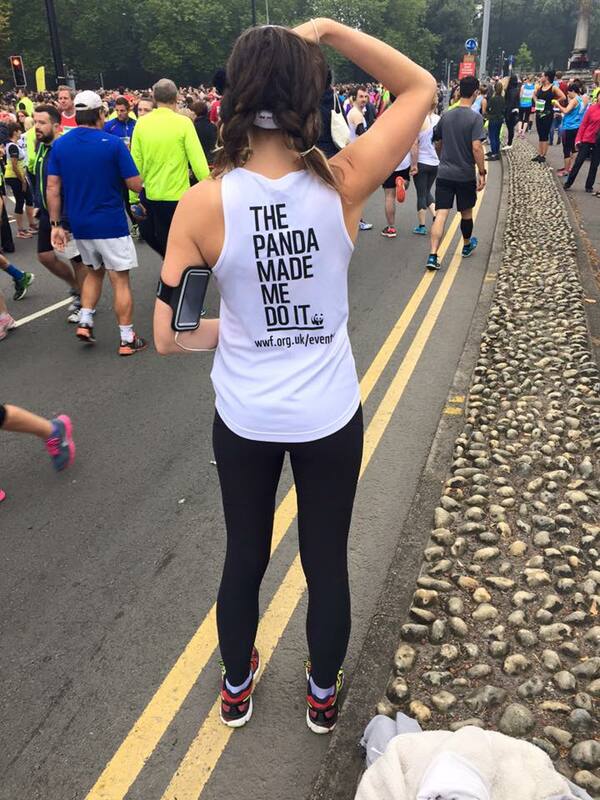 I walked up the hill and was joined by a fellow panda named James also running for the WWF. We walked up the hill together chatted a bit and then both reached the top, commended each other and were ready for one last mile to the finish line. At this point things start to become a blur, as you reach the city centre the crowds start to build and the runners start to funnel in close to each other and sweep through the city roads. At this point I'm not really thinking about anything, just concentrating on not stopping and keeping one foot in front of the other and as I turn a corner I see it. The Finish Line. It's literally a 100 metre run to the end, I was coming to the end of my first half marathon. 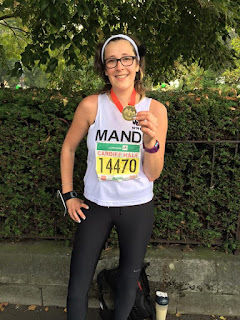 I raised my arms in celebration at crossing the finish line and get chorused through by volunteers passing you water, bananas and directing you to receive your sized running t-shirt and finally your medal. 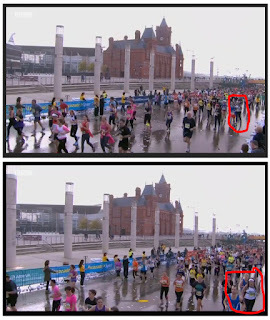 I heard my name being called and realised that my boyfriend was there at the finish line and had watched me come through. I walked over for hugs and continued to walk through to the exit of the finish line. I didn't want to stop at this point, I felt like I was floating I just kept walking. I drank the water, had a recovery sachet and ate my banana and finished with a massage and wasn't feeling too bad so headed back to the finish line to support any runners still yet to finish. After cheering and waving and clapping other runners through we decided we should start making our way home as we had another half hour walk back to the car and a three hour drive home. The walk back to the car was gruelling I really was hurting at this point. The back of one knee and the opposite hip were throbbing and upon reaching the car I flopped into the passenger seat where my partner kindly drove us home. 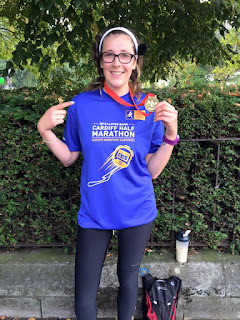 I wore my medal and commemorative t-shirt the whole way home and felt so proud. 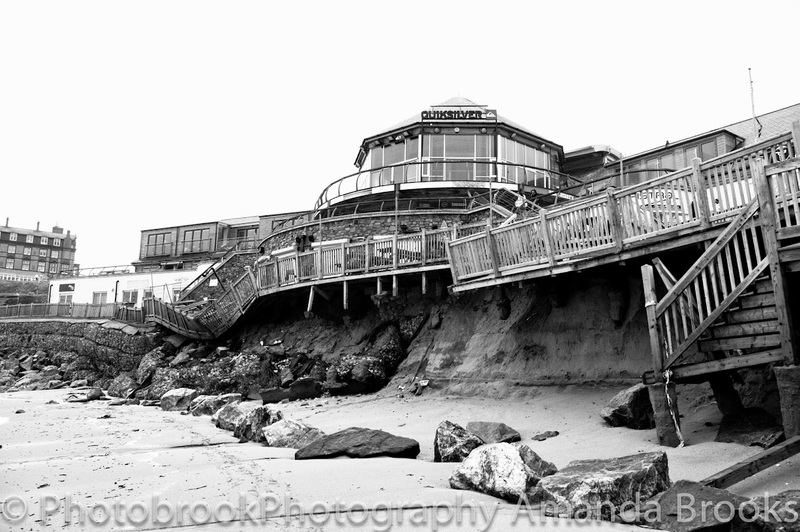 The next few days were interesting when walking upstairs but after a couple more days my legs were feeling more normal. 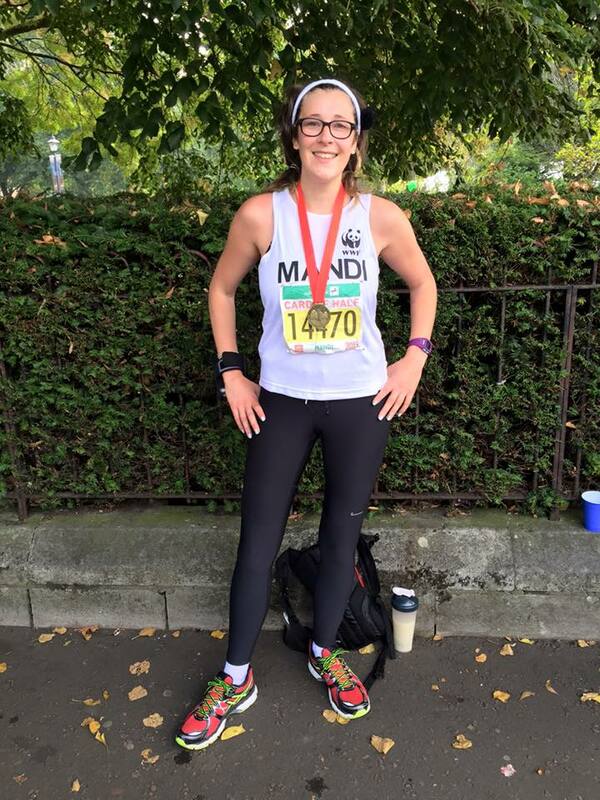 I had done it, I had run a half marathon. 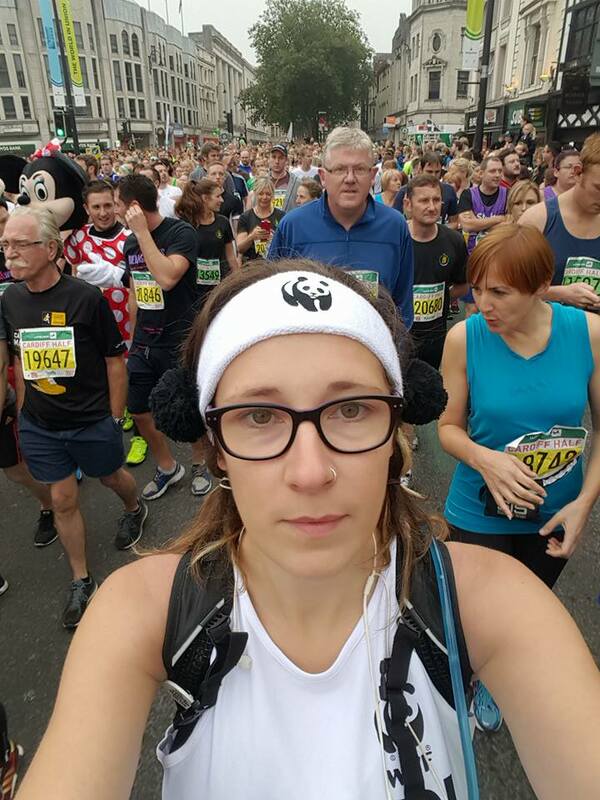 From my first ever Park Run to a half marathon in just 10 months and I had raised over £400 for the WWF. 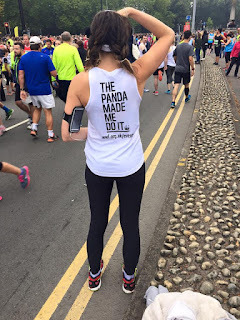 I felt AWESOME and it wasn't long before I was back at Park Run the following week and already perusing through the internet finding out what my next run to enter would be.